Look out here we go! 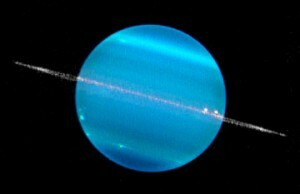 Uranus is the dynamic planet of awakening, of letting go of old ways usually through unexpected and disruptive action. It shakes us out of our delirium and orders us to get out of our self imposed cage and do something about our life. No more blame. In Aries the fire sign, the emphasis will be on independence and new beginnings. Uranus will bring us all changes this year (2011). If there are areas in your life that are stagnant, limiting, and intolerable,Uranus will target them. Unfortunately it can be an upheaval if you are not living positively and proactively. It is a time also of spiritual tests and awakening. If we use this time to change what needs changing with the courage Aries delivers us, we will be new individuals once this transit is over. We can bring new innovative changes to the world now, We will find this transit of Uranus will bring breakthroughs in science, medicine and technology. The last time Uranus was in Aries was from 1927 to 1935, when the stock market crashed and the great depression started. That certainly seems like another possibility, as does a world war (Aries is the sign of war). Uranus also rules revolt, and the dictatorial regimes that revolt often engenders – Iran, for example, is an Aquarian nation, (ruling planet is Uranus). The action to come will be for liberating those who are limited in their current existence, from one country’s struggle to the individual plight for freedom. Where Uranus lands in our individual natal charts can direct us to the changes ahead for us, and help guide our hands to what needs fixing. Be advised, it will affect us all, so the old adage, “Know Thyself” takes on a special importance. It is the way to our new selves.